Buying candy was such a treat when I was growing up. I remember one of my friends found a whole dollar bill lying on the ground, and a group of us were going to go the local grocery store and split it four ways to buy a candy bar. I think my mom put the kibosh on that plan, and I never did get my candy bar. One of the rare times we got to eat candy was when we were on vacation. Every summer, we drove to the shores of Lake Huron for a vacation with my extended family. My parents let us little kids tag along with the older cousins. After we were tired of playing on the beach, we would walk down the road from our cabin to the pink store, otherwise known as the gas station. We would amble down the country road, leggy kids with straight 70′s style hair, short shorts, knee socks and tennis shoes. The younger cousins would stand around the candy aisle first and carefully select the most candy we could buy with our tightly gripped, slightly sweaty coins. Then we would head to the back of the store to watch the older cousins play pinball. We would buy Charleston Chews, Jolly Ranger sticks and candy cigarettes with red tips. We pretended to smoke on the walk home. “Look, Mom and Dad, we’re smoking!” Weren’t we clever? Our parents would laugh, and then we would go to someone’s cabin to play games. My favorite candy of all was the vanilla Charleston Chew, which I would stick in the freezer and then bang it on the table to crack it. What’s your favorite childhood candy? 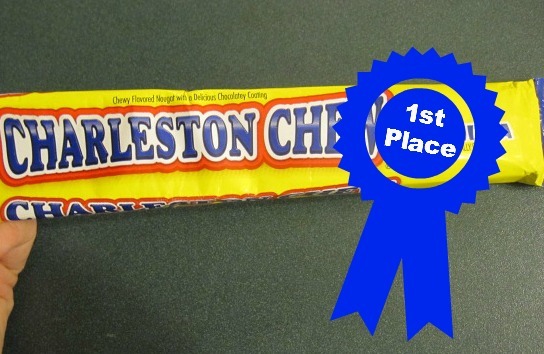 Mmmm I love Charleston Chews too! Right up there with Big Hunks! I used to love Kit Kats but they just don’t taste the same anymore. I don’t know if it’s me or they changed the recipe. Either way I am kind of bumming. They probably changed the recipe. That’s too bad! I remember those, but never have had the privilege of trying one. Mine is Mounds. I like Mounds, too, and Almond Joy is even better! My parents owned a general store in Solvang California when I was a kid. I remember we had this giant taffy puller thing in the front window that always brought a bunch of attention. We never ate that stuff as it was in the window for weeks/months at a time and probably was full of dust and bugs. There were huge bins of taffy that for selling and I could never keep my hands out of them. I just loved salt water taffy. Still do. The only flavor I didn’t like was banana. Go figure. Oh, wow, I’ve seen those taffy puller in tourist shops and never knew it wasn’t fresh! I really love salt water taffy–but you’re right, the banana flavor is kind of ick. I remember it well…..Sweet Tarts came out when I was in grade school, I loved them and still do! Oh, I love Sweet Tarts, too! I eat them when the kids get them for Halloween. I can’t eat them much because of my TMJ. I do love them, though. Oh, happiness in a post about candy! My dad worked for M&M Mars (now called Mars, Incorporated, I believe) for over 30 years so many of my childhood candy memories are about eating M&MS…on…wait for it… THE DAY THEY WERE MADE! Let me tell you, I raise such a stink about un-fresh candy these days, because I know how it can/should be. Oh, my gosh, you just made me completely jealous! I know I probably have never had fresh M&M’s! It ridiculous how expensive a candy bar is. I also miss having a full sized candy bar. Now I usually have bite sized ones around Halloween time.